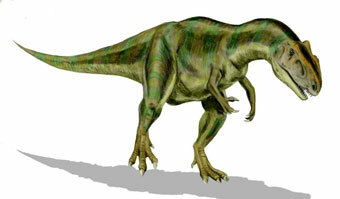 The first dinosaur fossils to be identified and named were discovered in the 1820s. 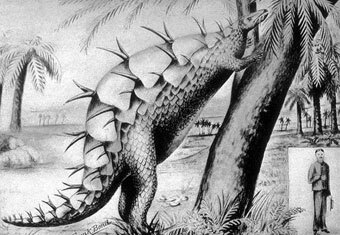 Artist's impression of the stegosaurus (1914) (Linda Hall Library). Scientists have calculated that the dinosaurs dominated the earth for over 100 million years before dying out at the end of the Cretaceous Period, 65 million years ago. The earliest creatures were fairly small in size but by the Jurassic period, the giants had begun to appear including the 25-metre long brachiosaurus. 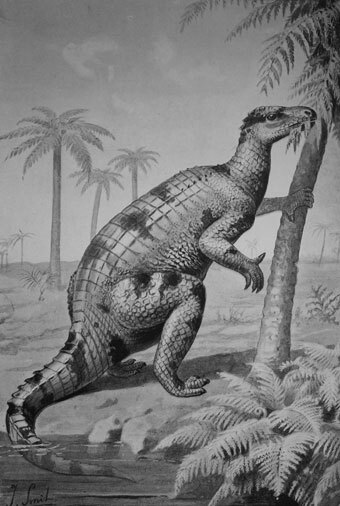 Among the dinosaurs referred to by Conan Doyle in The Lost World are the stegosaurus (a heavily armoured herbivore), iguanodon (one of the earliest herbivores able to chew its food) and allosaurus and megalosaurus (large carnivores). Other prehistoric creatures that are mentioned in the book include the pterodactyl (a large flying reptile) and the ichthyosaurus (an aquatic reptile). With the author's poetic licence, they are mixed up from different periods in time. 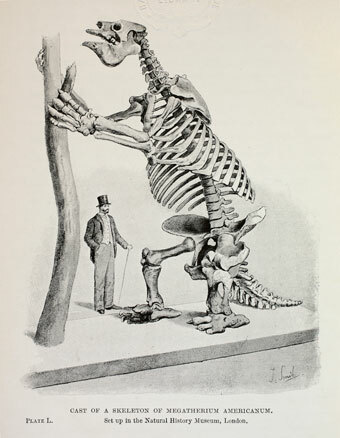 Iguanodon from Henry R Knipe's Nebula to Man (1905) (Bristol Libraries). It is still unclear why the dinosaurs became extinct. Among the theories are climate change, asteroid impact and a volcanic eruption. The Lost World is based on the premise that because the dinosaurs have been contained on the isolated plateau, undisturbed for millions of years and cut off from 'the ordinary laws of Nature', they have been able to survive. In the novel, the Indians have domesticated some of the herbivores, herding them like cattle. They construct dinosaur traps and go out hunting, but live with the danger of being crushed to death by the carnivores whose unusual killing method, as described by Conan Doyle, is to fall upon their prey with their full weight. In reality, humans and dinosaurs never co-existed – the first species directly related to humans only appeared about three million years ago, long after the dinosaurs had disappeared. As for crushing victims to death, although it may possibly have happened on occasion, the carnivores are more likely to have relied upon their claws, teeth, powerful jaws and fast-moving hind legs to get the job done. 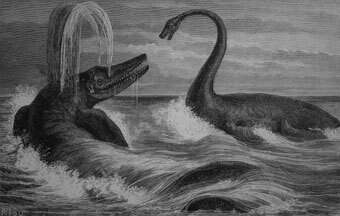 Encounter between ichthyosaur and long-necked plesiosaur from Louis Figurier's The World Before the Deluge (1865) (Bristol Libraries). Fossilised remains of extinct creatures played an important role in the development of Charles Darwin's theory of evolution by natural selection. Those that were similar in form to living creatures became part of the growing body of evidence he gathered that proved that species were not fixed at the point of creation, but were able to change over many generations in response to their environment. Among the fossils he uncovered during his time in South America were the glyptodon (a giant armadillo), the megatherium (a giant sloth) and an early version of the capybara (a giant rodent). At that time extinction and transmutation (species change) were difficult for many to accept as they suggested a flaw in God's creation. If God had created a perfect world and the creatures to inhabit it, what reason would He have for allowing some species to die out and others to change in form? While some theologians and scientists either denied these things happened, or found a divine explanation for them, Darwin concluded that they happened naturally. Darwin: a graphic biography tells how he developed his argument before publishing his theory (see Books for availability). Megatherum americanum from the Rev H N Hutchinson's Extinct Monsters and Creatures of Other Days (1910) (Bath in Time – Bath Central Library). You can find out more about fossils and dinosaurs in the readers' guide on the Downloads page. 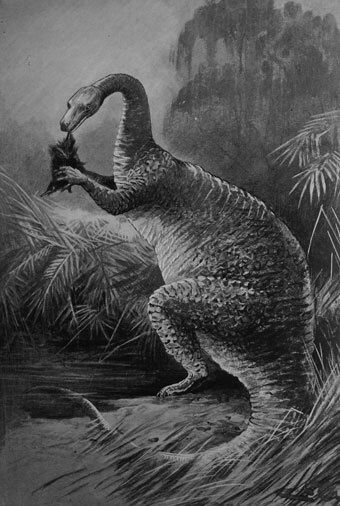 Megalosaurus from Henry R Knipe's Nebula to Man (1905) (Bristol Libraries). 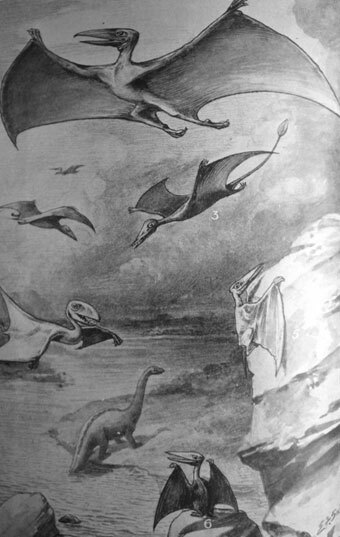 'The Age of Flying Reptiles' from Harmsworth's Natural History (1910) (Bristol Libraries).